Memorial University faculty members Max Liboiron (Sociology), Dean Bavington (Geography), and Charles Mather (Geography), along with Josh Lepawsky (Geography) and Mario Blaser (Aboriginal Studies), are spearheading an exciting and innovative interdisciplinary project that looks at research methodologies and ethics in a permanently polluted world. They will be focusing on developing methodologies for participatory citizen science on marine plastics, where local experts such as fishermen and women are full collaborators who co-create research questions, collect data, analyse findings, and mobilize research. 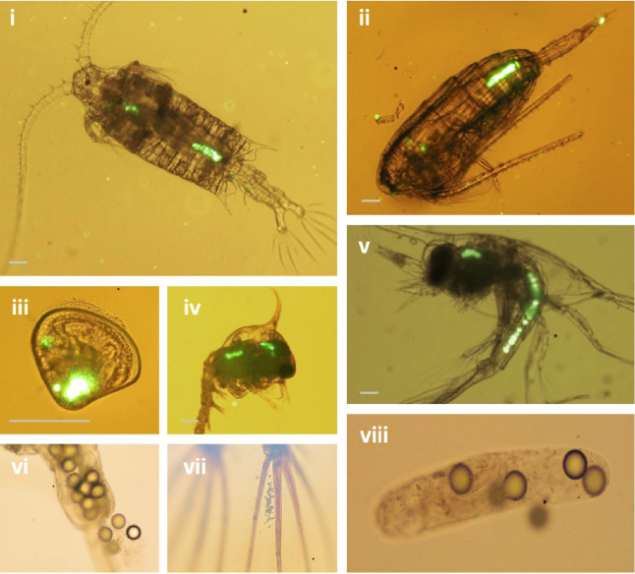 Images of microplastic ingestion by plankton. From Cole, Matthew, et al. We are looking to recruit two Masters students and one PhD student for an interdisciplinary, STS-driven project on Action Research Methods for the Anthropocene. The aim of this two-year project is to develop methodologies that are appropriate to researching and acting in environments that are affected by permanent pollution. Our main case is marine plastics, a largely invisible but permanent pollution problem emblematic of the Anthropocene. While the project will look at a variety of methodologies based in action, activism, and making change during research, we will focus on participatory citizen science in particular. This approach aims to democratize science by involving local experts such as fishermen and women as full collaborators who co-create research questions, collect data, analyse findings, and mobilize research. For more information, email Max Liboiron at mliboiron@mun.ca. We offer full funding to successful applicants. The thesis-based MA students can be based in either the Geography Department or the Department of Sociology. The PhD student will be based in the Department of Sociology at Memorial University of Newfoundland and Labrador. All students will be part of Memorial’s WaSTE Group (Waste in Science, Technology, and the Environment). Student start dates can be: Sept 1, 2015; January 1, 2016; May 1, 2016; or Sept 1, 2016. Students attending Memorial receive instruction in social scientific practices and methods appropriate to their field of study, leading to field research opportunities and the preparation of a research-based thesis. Our programs offer the chance to interact with a diverse array of fellow students and to live and study in St. John’s, the culturally vibrant capital of the ruggedly beautiful province of Newfoundland and Labrador. Our graduates go on to further advanced study, university faculty positions, NGOs, and government and private sector employment.